In technical terms, there is no such thing as a slipped disc. When you hear the term “slipped disc” used, you can almost certainly be sure they’re talking about a herniated disc or a bulging disc. Spinal discs are stationary parts of the body. They are the spongey, rubbery discs that sit between each of the vertebrae and absorb shock to protect the bones. 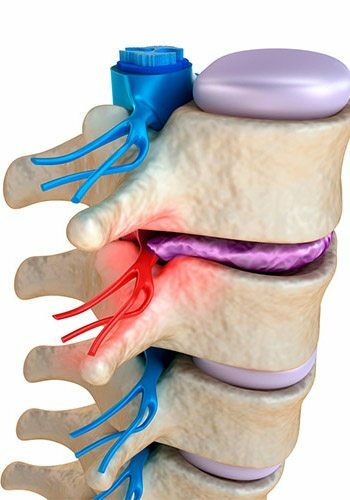 The discs are filled with a gel-like substance to make flexibility possible and are held in place by a strong network of spinal ligaments that prevents “slipping”. Because of this, the disc can never slip out of place! What is a Bulging or Herniated Disc? If we place increased strain on the intervertebral disc, the gel-like substance can push from the middle towards the outer edge, creating a “bulge” in the contour of the disc. The discs are normally like a water balloon moving with the spine, but can run the risk of stiffening and rupturing. Such changes can occur when uneven or torsional loads are placed on the spine and is most common when bending and twisting in the same motion. In some instances, this bulge and can put pressure on the sensitive nerves around the spinal cord. Recent evidence shows us that disc bulges are actually common in people who do not report having back pain, leading physiotherapists to believe that they are not a “nasty” structural abnormality as was once thought. In fact, reports indicate that disc bulges are prevalent in at least 50% of the population over 40 years old, without low back pain! Following unconditioned repetitive use, or a sudden incident (that usually involves a bent forward position), back pain can increase that may or may not be related to a bulging disc. Clinical assessment by a physiotherapist is required to determine all the contributing factors of the injury. Often further investigation such as MRI or x-ray is not required and in fact national guidelines recommend against scanning the low back for pain as the information is often misleading So if your health professional is recommending a scan or Xray of your low back- ask them why! How Can a Bulging Disc be Treated? If you have lower back pain, or just want to reduce the risk of getting it, call us today on 08 9481 1003 or fill out our quick online form – we are happy to provide an assessment and guidance on rehab or conditioning.